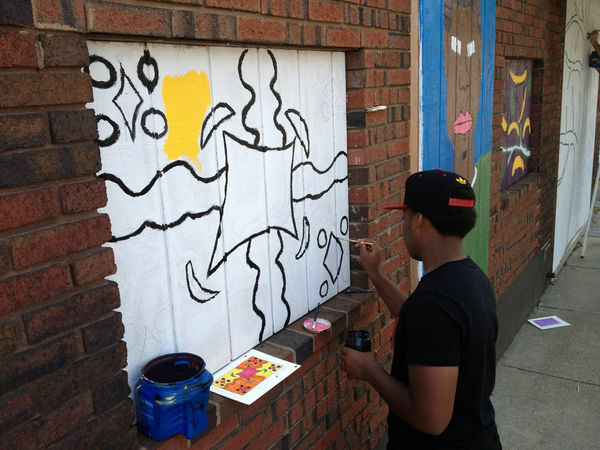 MUSKEGON HEIGHTS, MI – Teenagers painted lively colors on the front of the otherwise desolate Strand building this week, completing a mural painting project that is designed to highlight and beautify an historic part of Muskegon Heights. Nearly a century old, the Strand at 22 E. Broadway Ave. is symbolic of more prosperous times in Muskegon Heights, when the building was the city’s social hub, holding a theater, boutique apartments, shops and a law office. City officials believe that, redeveloped, the building could again revitalize the downtown area, and have sought to preserve the building’s structural bones by fixing its roof and boarding up its windows. City Councilwoman Patrice Johnson, who works as a parent liaison at Muskegon Heights Public School Academy High School, has been planning the mural painting for nearly a year.